The 2003 Mazdaspeed Protege was the first offering from the Mazdaspeed name plate. It was to be Mazda's hot rod shop ala Mercedes AMG, BMW M-series, Ford's SVT, etc. The Mazdaspeed was spawned from the righteous handling 2001-2 Protege MP3 model. The MP3 name was derived from the audio MP3 file (think Napster) which was new at the time and the car was outfitted with a wacky Kenwood headunit that would do somersaults every time the car was turned on. Well known tuner Callaway Cars was brought in to turbo charge the MP3 140 hp 2.0 engine. 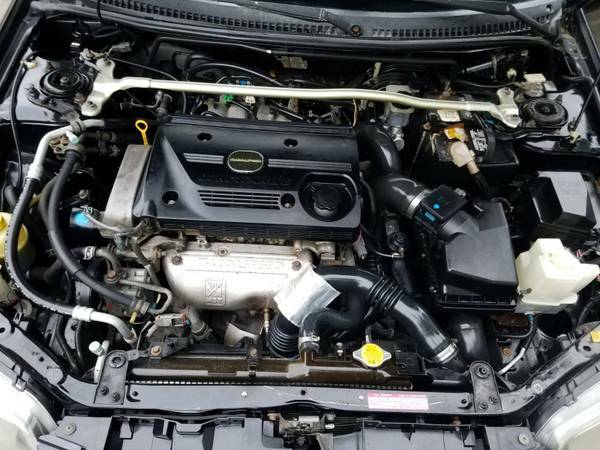 The boosted engine was good for 170 hp, but developed a horrible reputation for throwing rods if you upped the boost past 10 psi. 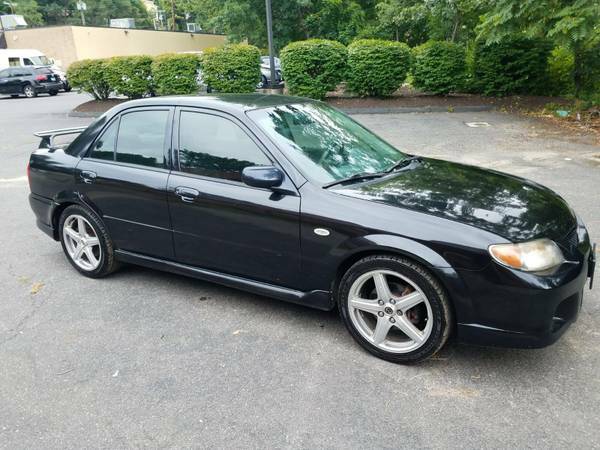 Find this 2003 Mazdaspeed Protege for sale in Waterbury, CT for $2,900 via craigslist. The ad says the car is from 2002, but seeing that is impossible it is rightly shown as a 2003 in this piece. There was also a 2003.5 update to the model that had a different designed rear spoiler and different paint colors. The listing is light on details, but it appears unusually clean and stock looking for having 153,000 miles. 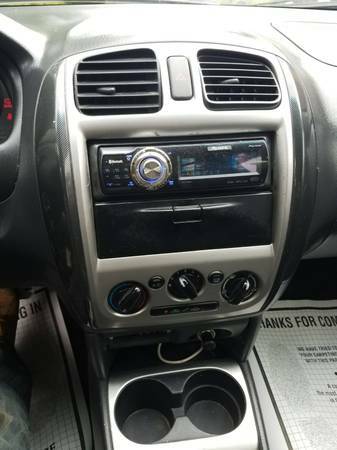 The overly complicated, but good sounding Kennwood headunit has been replaced here with a more standard deck. Interior pictures do not show whether the car has the factory Sparco shift knob. The special seats for the Mazdapspeed were sharp looking, but not overly bolstered or particularly comfortable. The 17" factory Racing Hart wheels are still present and look sharp even by today's standards. 2003 was the final year of the Protege so by early 2004 serious bargains could be had on these defunct cars. Sticker price was a hair over 20k and if memory serves correctly I paid about 14k. You hardly see these on the road any longer because of rust issues and the aforementioned motor internals being made of glass. It was the best steering and handling front wheel drive car I have ever driven. I subsequently owned a Focus SVT and preferred the Protege by a large margin. The Mazdaspeed drove like a four door Miata. Cory was able to get the Mercedes C36 AMG over to the paintless ding removal expert after finishing up the emergency cooling system repairs along with a set of fresh motor mounts. Totally agree. Think Mazda, and their overlords at Ford missed a great opportunity there. I'd be very surprised to find no rust on this example from the northeast. 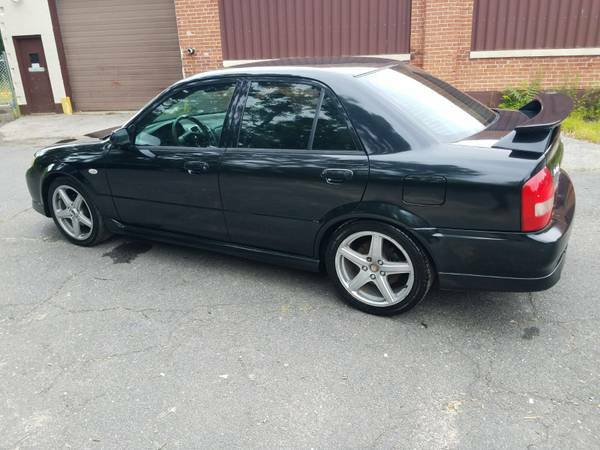 My '03 Protege LX had rust starting on the leading edge of the hood, and in the lower edges of the quarters by year four. Loved the light, agile feel of it, and the harmony of the brakes, steering, and suspension. Always wished I'd held out for one of these to compliment my Mazdaspeed Miata.